Wegener's granulomatosis (WG) is a necrotizing or granulomatous vasculitis of small to medium-sized vessels characterised by acute necrotising granulomas of the respiratory tract and focal necrotising glomerulonephritis . Pathogenesis is believed to be due to a T cell-mediated hypersensitivity reaction triggered by an infection or some environmental factor . The presence of granulomata, positive auto-antibodies, and the effective response to immunosuppressants confirm the diagnosis. The most important serological markers consist of PR3-ANCAs (c-ANCA), which are found in 95% of cases and are markers of disease status . WG can be restricted in the respiratory tract (“limited” WG) or can have systemic involvement, affecting the eyes, skin, and heart . It is uncommon for WG to manifest in the gastrointestinal tract (GIT). There are some reported cases of upper GIT involvement (oropharyngeal mucosa lesions, small intestinal perforation) or lower GIT (colonic, perianal ulceration) however there are very few cases presenting with pancreatic mass and pancreatitis . We present two cases of isolated primary pancreatic WG mimicking pancreatic adenocarcinoma which were treated by surgical resection. Two patients presenting with abdominal pain were investigated with CT imaging and were found to have pancreatic mass. After reviewing imaging within a specialist multi-disciplinary team (MDT) meeting, a provisional diagnosis of pancreatic adenocarcinoma was made and given that the lesions were deemed resectable, the both patients underwent surgical exploration. A 57-year-old man presented with abdominal pain and nausea. His past medical history included diabetes mellitus type 2, hypertension, and hypercholesterolaemia. The working diagnosis was a pancreatic tail adenocarcinoma. A locally advanced tail of pancreas mass with localised infiltration of the peritoneal reflection and descending colon mesentery with no evidence of distant metastases was shown on imaging (CT/MRI) (Figure 1). His CA 19-9 was within normal range. Following MDT discussion he proceeded to surgery where distal pancreatectomy, splenectomy, left colectomy and small bowel resection were performed. The histopathological report described a 47 x 45 x 30 mm necrotic mass with a palisading granuloma and vasculitis, predominantly involving the pancreatic adipose tissue with infiltration into the pancreas, the colon and splenic capsule. The small bowel specimen had only serosal fibrosis with adhesions to the adjacent connective tissue. No malignancy was identified and there was no lymph node involvement. Grocott staining for fungus and Ziehl-Neelsen staining for mycobacterium were negative. The combination of geographic necrosis, palisading granuloma and vasculitis was highly indicative of WG. The patient was ANCA negative, CT of facial sinuses and lung function tests were normal. Figure 1. 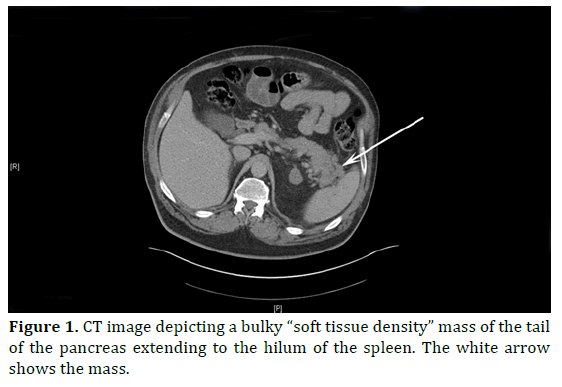 CT image depicting a bulky “soft tissue density” mass of the tail of the pancreas extending to the hilum of the spleen. The white arrow shows the mass. A 68-year-old woman presented with a three-month history of worsening abdominal pain, weight loss and jaundice. She had been diagnosed with type 2 diabetes three months prior to onset of symptoms. The patient’s past medical history included hypertension, asthma, diverticular disease, hypothyroidism, and a previous cholecystectomy. A CT and MRI scan of the abdomen showed an obstructing mass within the uncinate process of the pancreas and a second infiltrative mass in the tail of the pancreas encasing the splenic vein (Figure 2A, 2B). The uncinate process mass was causing a clear “doubleduct” sign. An ERCP was attempted, but it failed and a percutaneous transhepatic biliary drain was inserted to relieve the jaundice prior to surgery. Her CA 19-9 was also negative. Both pancreatic tumours appeared resectable and following an MDT discussion a total pancreatectomy was performed. On pathology, both lesions proved to be necrotic masses with granulomatous inflammation and vasculitis, involving the common bile duct (the central one). Ziehl-Neelsen staining for mycobacteria and PAS for fungi was negative. Again, WG was considered the most likely cause for the observed histological features. CT of facial sinuses and lung function tests were again normal. She was p-ANCA positive (Anti MPO Ab= 8.8u/mL; normal range<3.4u/mL). There was no history of photosensitive rash, mouth ulcers or Raynaud’s disease. She has suffered from some morning stiffness lasting a few hours, but has not had any nosebleeds, sinus congestion or nasal crusting. Both patients made a full recovery and discharged from hospital. Given the lack of other systematic symptoms of WG, they were discharged without steroid treatment and referred to a rheumatology service for further follow up. Until the 3-month period of surgical follow up, both patients remained asymptomatic without evidence of other manifestations of Wegener’s. Furthermore the 1st patient, who was treated with distal pancreatectomy, to date has not had any new lesions within the remnant pancreas two years after surgery. Figure 2. A. CT image depicting a mass at the uncinate process of the pancreas. The white arrow shows the mass. The white arrow head shows a cyst of the left kidney. B. CT image from the same patient showing the second mass at the tail of the pancreas in close proximity with vessels of the splenic hilum. The white arrow shows the mass. Wegener’s granulomatosis is a rare potentially lifethreatening inflammatory vasculitis that typically involves vessels in the nose, sinuses, ears, lungs and kidneys; however any other site might be involved. It requires life-long immunosuppression . The gastrointestinal tract and the pancreas are rarely affected ; however it has been associated with recurrent episodes of acute pancreatitis [3, 4]. WG can also affect the pancreas in conjunction with other exocrine glands such as the parotid and could result in pancreatic insufficiency [4, 5]. A Medline search between 1950-2013 was performed using OVID interface [pancreatic] AND [mass] AND [vasculitis] OR [Wegener’s granulomatosis]. We were able to identify 6 other reported cases of vasculitic masses in the pancreas falsely being diagnosed as pancreatic adenocarcinoma (Table 1) [6-11]. Including the two cases reported here, the mean age of all patients was 61.3 years and predominantly affects women; only 6/8 patients had positive autoantibodies (2/5: p-ANCA, 4/6: c-ANCA). The anatomical distribution of the masses affected both proximal and distal pancreas Only 3 patients had isolated pancreatic lesions, whilst the rest had other systemic manifestations of WG. All the patients were provisionally diagnosed with pancreatic adenocarcinoma. Two patients received medical treatment only, two had a pancreaticoduodenectomy, one had a partial pancreatectomy, two had a distal pancreatectomy, and one a total pancreatectomy. As one can see in Table 1, the diagnosis of isolated primary pancreatic Wegener’s may be extremely challenging in the absence of other systematic manifestations like lung masses and even in the presence of other systematic manifestations, the suspicion of pancreatic Wegener’s remains extremely low. Wegener’s Granulomatosis represents one of a number of benign diseases mimicking pancreatic adenocarcinoma; given that pancreatic resection represents a major procedure, surgery without prior tissue confirmation may be questionable. In the UK mortality rate following pancreaticoduodenectomy range between 3-5%, with an associated morbidity of 35-50% . Respective rates for distal pancreatectomy are 2% and 35% . Pancreatic adenocarcinoma carries grave mortality with a 5-year survival less than 5% . Given the anatomic location of pancreas, a pancreatic tumour may be rendered inoperable due to its local extension and not only the risk of distant metastases . The only potentially curative treatment remains surgical resection, but refers only to 15- 20% of patients . Hence prompt accurate diagnosis is pivotal, in order to identify this subgroup of patients with a resectable tumour . The mainstay for diagnosis is cross-sectional imaging with CT being the “gold standard” [14, 16]. CT has a sensitivity of 89-97% for pancreatic tumours . Although the positive predictive value for unresectable disease (i.e. predicted unresectable disease too truly be unresectable) is 89-100%, its sensitivity for resectable disease is only 45-79%. This is due to the staging criteria that favour specificity over sensitivity, thus minimising the subpopulation of patients with potentially resectable tumours that are not offered surgery . To this end, Endoscopic Ultrasound is superior to CT in order to further delineate the local extent of a pancreatic mass, but cannot exclude metastatic disease [14, 16]. Magnetic resonance imaging may be superior to CT in detecting small hepatic and peritoneal metastases [14, 16]. According to the clinical practice guidelines of the European Association of Medical Oncology and the European Society of Digestive Oncology (ESMO-ESDO), preoperative histologic proof of malignancy is not obligatory for patients who will undergo surgery with curative intent . Histologic diagnosis is required only before neoadjuvant or palliative chemotherapy . Between CT-guided and EUS-guided fine-needle aspiration (FNA), the later is superior and recommended since it is associated with decreased risk of peritoneal seeding, bleeding, and infection, compared to CT-guided FNA. According to the National Comprehensive Cancer Network Guidelines, if a biopsy is negative, that should not delay surgery if the clinical suspicion for pancreatic cancer is high . Adherence to the above practice inevitably leads to a cluster of patients undergoing a pancreatic resection without having cancer, which currently in our institution accounts for 7% of all pancreatic resections (unpublished data). Overall, our view is that this is an accepted medical practice given the grim prognosis of pancreatic cancer. Constitutional symptoms of pancreatic malignancy may be reproduced by a number of benign diseases including severe chronic pancreatitis and a systemic vasculitis. Therefore, tissue biopsy and autoimmune screen may need to be incorporated in the diagnostic evaluation of a pancreatic mass, as long as clinical suspicion for malignancy is not overwhelming and these do not delay detrimentally the time of surgery. Benign diseases, such as WG, can clinically and radiologically mimic pancreatic adenocarcinoma. Differential diagnoses like these need to be excluded to avoid unnecessary surgery and accelerate appropriate treatment. To this end, EUS-guided FNA and autoimmune screen may be helpful to discriminate between malignancy and vasculitis, providing that there is lack of compelling suspicion of malignancy and the undertaking of those diagnostic modalities will not delay surgery. Authors do not have any conflict of interest. Mitchell RN, Schoen FJ. Blood Vessels. In: Kumar V, Abbas AK, Fausto N, Aster JC, eds. Robbins and Cotran: Pathologic Basis of Disease. (8th edition) Saunders Elsevier, Philadelphia, US. 2010; 516-17. 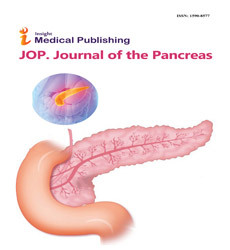 Hruban RH, Iacobuzio-Donahue C. The Pancreas. In: Kumar V, Abbas AK, Fausto N, Aster JC, eds. Robbins and Cotran: Pathologic Basis of Disease. 8th ed. US, Philadelphia: Saunders Elsevier; 2010; 898-903. National Comprehensive Cancer Network Clinical Practice Guidelines in Oncology (2012). Pancreatic Adenocarcinoma, Version 2.2012. Available at: http://www.nccn.org/professionals/physician_gls/pdf/ pancreatic.pdf (accessed 24/02/2014).